And immediately the pressure mounts, but hold up a minute! The fact that you will soon be marrying the person you love, the person you plan to spend the rest of your life with and that he has just announced to the world that you are his one and only! And this really is the reason for the wedding to marry the person you love. And while the engagement is a very special time, being married is even better. So once you have had an opportunity to enjoy yourself , then it is time to start planning your special day because having a plan with clear time lines will help to substantially reduce your anxiety level, while keeping you organized and focused. But before you start planning, I suggest you do some reading this will allow you to see what others have done and help you to get some inspiration and ideas that you can incorporate into your own wedding planning. You will find lots of really good magazines and books about weddings available in stores and online. 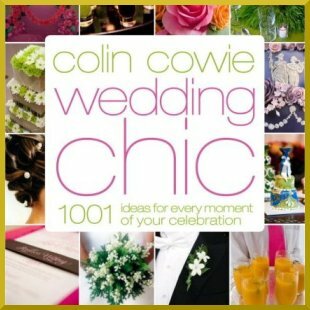 A book I recommend is “Wedding Chic: 1,001 Ideas for Every Moment of Your Celebration” by Colin Cowie. In it Colin provides you with expert advice that you can use for making your wedding a celebration of your personality and style. Another driver behind your planning will be the season in which you decide to have your wedding. As deciding on the season will not only determine just how much time you have to plan your special day but will also affect the cost. You see it will likely cost you more to have your wedding during the popular dates like late spring, early summer or Valentines day and a little less in the quieter winter months. Create a prioritized list of what needs to be done and by when. Which will include confirming your wedding date, venue, wedding officiant and catering first. No matter the type of ceremony you decide on, traditional church wedding, a destinations wedding or a wedding on the beach, you want to make sure that your date, venue, wedding officiant and catering are secured. Make a 'To do' list. And set aside some time each week for you and your partner to review, remove and update completed items. And only leaving any items left to do and by when. Agreeing who will do what by next week. Of course it doesn't have to be next week, but often is better than not at all and ensures tasks don't get missed. Delegate. There is absolutely nothing wrong with leaning on friends and family to help you with you wedding. In fact you will find that most of your family and friends are usually quit eager to help if asked. Just remember that it is your wedding, so do not allow others to cause you to lose your dream as sometimes people can take over without meaning to. If this appears to be happening, gently remind them that it is your wedding and that you want your way. Set a budget for your wedding. I probably should have suggested you start with a budget but I really do not want you to allow your budget to overwhelm you as your wedding day will be beautiful on any budget . But your budget is extremely important as you will be surprised just how easy it is to spend, spend, spend. If money is not an object then no problem; but if it is then you want to keep track of your spending. You do not want to miss our next article when we will be sharing with you ideas for creating your wedding planning checklist inclusive of suggested time lines. And should you have questions about your wedding planning, just email me at glenn@bahamas-destination-wedding.com and I will get the answer for you.